APPSC Group 3 Notification 2018 last date extended till January 29, apply via psc.ap.gov.in: Andhra Pradesh Public Service Commission, APPSC has extended the last date of registration till January 29, 2019, for Group 3 Panchayat Secretary posts. Candidates who still have not applied for the post can do so through the official site of APPSC at psc.ap.gov.in. The last date for payment of fee is till January 28, 2019. Earlier, the last date to apply was till January 19, 2019. The recruitment would be in Group III in the pay scale of Rs. 16,400 – Rs. 49,870. The online registration process was started in December 2018. 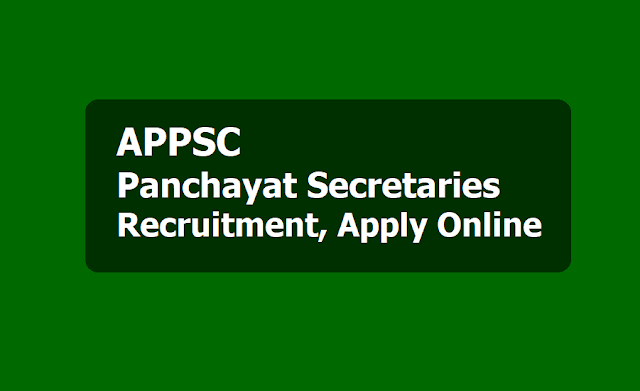 The recruitment process will fill 1051 Panchayat Secretary (Grade IV) posts. The screening test will be conducted on April 21, 2019, across the state. The main examination will be conducted on August 02, 2019. Candidates who have a degree of a recognized university are eligible for the posts. Age limit for the recruitment is minimum 18 years of age and maximum 42 years of age as on July 1, 2018. Candidates can check out the official site of APPSC for more details. APPPC has extended the last date for the submission of applications for the post of Panchayat Secretary for the second time. The Andhra Pradesh Public Service Commission or APPSC Panchayat Secretary application can now be submitted till January 29, 2019. This is second time the Commission extending the last date for the application for submission for the recruitment of 1,050 vacancies in the A.P. Panchayat Raj Subordinate Service. However, January 28, 2019 is the last date for payment of fee (up to 11:59 mid night). The application forms can be submitted on the official website, psc.ap.gov.in. "Last date for submission of applications for the post of Panchayat Secretary (Notification No. 13/18) is 29/01/2019 (Note: 28/01/2019 is the last date for payment of fee up to 11:59 mid night)," said official notification posted on the official website of the Commission. Earlier, the APPSC had fixed January 19 as the last date but later that was extended upto January 26. According to an APPSC notification released in December last year, candidates have to pay Rs. 250 as application processing fee and Rs. 80 as examination fee. Candidates hailing from Andhra Pradesh and belonging to SC, ST, BC, PH and Ex-Service Men, Families having household supply white card issued by Civil Supplies Department, A.P. Government, and unemployed youth are exempted from paying examination fee. Before applying for the post of APPSC Panchayat Secretary, the notification also said, applicants will have to register their bio-data particulars through One Time Profile Registration (OTPR) on the Commission website, psc.ap.gov.in. Once the applicant has registered the particulars, a user ID will be generated and will be sent to the registered mobile number and email ID. The Andhra Pradesh Public Service Commission (APPSC) has extended the last date to apply online for the posts of Group 3 Panchayat Secretary (Grade - IV) in Andhra Pradesh Panchayat Raj Subordinate Service. There are around 1051 vacancies to be filled through the examination. So, Candidates can apply through the official website - https://psc.ap.gov.in. "The last date for submission of applications for the post of Horticulture Officer (Notification No.12/18) is extended up to 02/02/2019 (Note: 01/02/2019 is the last date for payment of fee, up to 11:59 mid night) and the last date for submission of applications for the post of Panchayat Secretary (Notification No. 13/18) is extended up to 29/01/2019 (Note: 28/01/2019 is the last date for payment of fee up to 11:59 mid night)." Which books are useful to refer? Interested and eligible candidates should apply online only at www.apspc.gov.in from 09.07.2013 to 31.07.2013.
is there any minus marking in the exam??? nooo.. there is no negative marking in the exam... all the best..
how to prepare we vill get any material or model for this paper.is ther any cut off marks,how much marks includes qualify for this exam. DUE TO ELECTIONS THE GOVT HAS STOPPED THE NOTIFICATION..AFTER ELECTIONS THEY WILL ANNOUNCE THE APPLICATION PROCESS AND DATES. i've received mail from appschelpdesk@gmail.com saying that application form will be available from next month. You will get the Application form after panchyat elections. cut off marks for oc gents?? ?